What's New in Swarm 2018.3? The 2018.3 release of Helix Swarm offers enhanced authentication. Integrate your 2018.2 Helix Core server with Helix SAML to authenticate users via popular solutions, such as Ping Identity and Okta. ​​​​​​See code reviews from multiple Helix Core servers using a single Swarm dashboard. What's New in Swarm 2018.2? The 2018.2 release of Helix Swarm offers workflow enhancements. Ability to specify how many up-votes are needed before a review can be approved. Enable default reviewers that cannot be removed from a review. Organizations often break up a project into modules and sub-modules. With exclusionary mapping, admins can specify repository paths that should be omitted from a project branch review. This helps reduce project set-up time. What's New in Swarm 2018.1? Helix Swarm 2018.1 adds support for MFA, comment threading, and other collaboration improvements. In the 2018.1 release of Helix Swarm, users can start threaded conversations by replying to a review comment. The reply displays as a nested sub-comment. This allows users to have multiple conversations within a single comment. When submitting code for review, users can request a single pre-commit review with multiple changelists. It’s also easier to add, delete, and replace changelists and files within a review. Once MFA is implemented on the Helix Core server, Swarm users will be required to provide additional authentication factors to access Swarm. Helix Core integrates with Okta and is configurable with other MFA tools. The improved side-by-side diff function scales well with numerous review revisions. The updated interface is also more intuitive. With the new review description field, users can add a description of the review contents, summarizing their work when they submit it for code reviews. You can now set up batch notifications to automate and reduce the number of notifications users receive. What's New in Swarm 2017.4? Helix Swarm 2017.4 eliminates productivity blockers so you can focus on the projects that matter the most. In the 2017.4 release of Helix Swarm, individual users can unfollow all of the projects and users they are following. Admins can unfollow users and projects for other users. This can be helpful when you remove users from Helix Core and no longer want them to see the projects and users they are following. Stop wasting time on lengthy, automated tests once you know your codeline is stable. Helix Swarm 2017.4 lets users disable tests on approve and commit from their global settings. 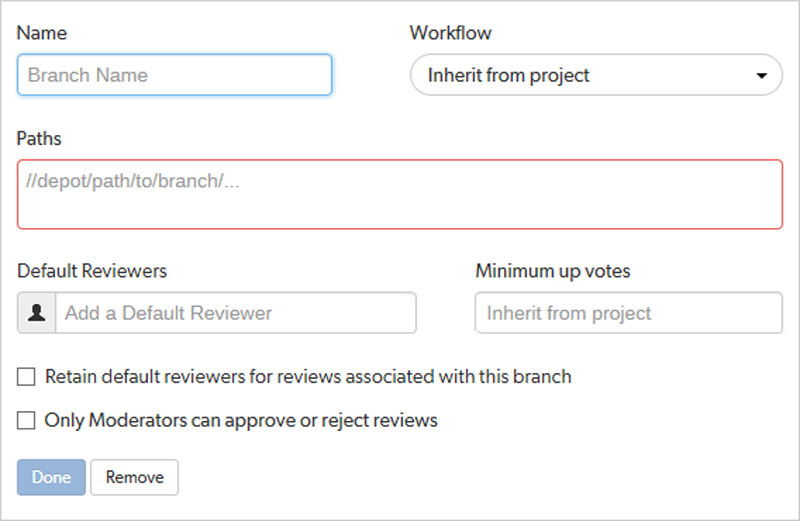 Set default reviewers for projects and project branches, which get added when you create a new review. What's New in Swarm 2017.3? The Helix Swarm 2017.3 release helps groups of reviewers stay in sync and on track. Helix Swarm 2017.3 gives project owners, review authors, and commenters the ability to add group moderators, reviewers, and @ mentions. Instead of manually adding multiple individual users, you can set up a group of individuals who can approve, vote, or comment on a review. Organize your projects and teams into subgroups to save time and effort when managing large projects. The 2017.3 release of Swarm makes adding individuals to groups — who share the same set of permissions or goals —faster and easier. Make sure your code reviews never go unnoticed by enabling Swarm to automatically send email notifications to a group mailing list. As with individual users, group owners have the option of setting notification preferences for the group to reduce inbox noise. In addition to finding or filtering out reviews as an individual reviewer, Swarm now grants individuals the flexibility to find and filter out reviews when they are members of a group that is set as a reviewer. Sometimes a little outside input helps ensure you didn’t miss anything. Sometimes you need the approval of all major stakeholders to implement a significant change. Now users can require approval from one or all members of a reviewer group when creating a review request for greater flexibility. What's New in Swarm 2017.2? Helix Swarm 2017.2 offers enhanced performance for code review and collaboration at scale. Load, view and filter large numbers of open reviews up to 14 times faster. Large organizations can leverage Swarm to increase productivity and manage multiple code review sessions across concurrent projects with many contributing developers. Admins can now configure Swarm to manage reviews with large numbers of files more efficiently. Swarm prevents excessive load times by optionally reducing “expand all” options for open reviews. Swarm controls your view of large files with two unique options, including a full view of file content or a file diff view to reference previous versions. Both settings are configured in Swarm to automatically set file size and file diff limits, offering a truncated view of content for faster access and greater efficiency when making review changes. Organize your review library with active review sorting that filters your review list by priority based on activity. Support efficient workflows across global teams with a clear view of pending reviews to act on. What's New in Swarm 2017.1? Helix Swarm 2017.1 offers even more ways to collaborate and improve rapid release cadences at scale. Access an intuitive and collaborative activity dashboard at login, showing a user the reviews they need to work on next. It shows open reviews needing resolution by reviewers, or reviews needing revisions by authors. Don't waste time on reviews you don't want or need. The Review Panel feature for Swarm 2017.1 lets users drill down to the workday tasks important to them, filtering by comments, and filtering by vote. Control precisely the notifications you receive, and when you receive them, based on your preferences. These settings are applied to your profile page. Configure fine-grained controls over when email notifications are sent. Also, global settings across the entire product can be set by the Swarm administrator, and individual users can customize these settings as necessary, controlling the circumstances in which they receive an email. What's New in Swarm 2016.3? Large files to review? Thousands of lines of code to scroll through? Helix Swarm now incorporates faster load times — as fast as one second — for large text files with more than 2,000 lines of code, scaling gracefully and facilitating side-by-side comparisons of files with their base version. In 2016.2, we introduced private projects. Swarm 2016.3 extends that level of security to your P4V clients. Users who are non-members of private projects will have restricted view modes excluding the review ID and state in P4V Visual Client. Swarm 2016.3 makes it easier for large teams to scale the review process to multiple iterations by providing users with the option to see all comments or only those tied to a specific version. This enables more effective and efficient code review, even as the number of revisions your team manages multiplies at a staggering rate. Even the best developer makes mistakes. The next time you accidentally delete a file that a trigger requires for automatic testing, simply replace it and your subsequent triggers won’t continue to return errors (falsely) informing you that your file doesn’t exist. In this release, IT can now specify active directory usernames of any format and any case for activity streams and more general usage within Swarm for greater clarity and flexibility among users. Swarm 16.3 enables reviewers to filter the list of reviews to those authored by a specific user for a more flexible, efficient user experience. Swarm's collaborative approach to code review means providing team members with the latest developments on all of their projects, without hindering their ability to get things done. Eliminate distractions and opt to receive only the notifications most relevant to the review at hand, unless specifically mentioned in another review. What's New in Swarm 2016.2? Give new ideas a test run under the radar or hide sensitive projects from external teams and third-party vendors, limiting code review on a need-to-know basis with private projects. Integrate syntax analyzers for automated review comments that allow teams to detect errors faster, ensure regulatory compliance, and build better software, all thanks to our new review-commenting API. What's New in Swarm 2016.1? Add, edit, and delete groups and sub-groups directly within the Swarm UI. Get a second opinion by assigning reviewer groups to your projects and avoid finger-pointing and confusion. Shift your attention to where it is needed the most. The My Reviews button offers you multiple filter options to suit your needs. Navigating the toolbar is easier than ever with its contrasting, flat design for a more modern, intuitive user experience. Spend less time waiting to trace changes in your files. Significant improvements to the blame function have reduced wait times from from 40 to 50 seconds down to a just a couple of seconds. We're supercharging the social collaboration process. In addition to up-voting an entire thread, you can now use the Like icon to make important comments stand out during the code review process. The next generation of our REST API is here for faster delivery of secure, reliable, and conformant code. Set Swarm on autopilot and get where you need to go. Now simpler and more powerful than ever before. What's New in Swarm 2015.4? Kick-start your projects and add an entire group as a project member in one swift click. All members of the added group (or any of its subgroups) become members of the project. Any changes to the group are automatically reflected in the project. Access the shelved changes tab from within the Swarm user profile page and get feedback faster so you can commit changes to the server with easier access to pending shelf changes, request reviews, and view review statuses from directly within the Swarm UI. Significant enhancements Swarm's diff features improve your workflow efficiency by allowing you to diff any two arbitrary versions of a file, not just the last two. Put hours back into your day and stop the painstakingly slow search for vaguely named files. In addition to the Microsoft Office Suite, Perforce' LibreOffice module now allows you to preview your Keynote, Pages, and Numbers files as PDF documents directly within Swarm. What's New in Swarm 2015.3? But using the intuitive new search feature to find project names, users, and files has only just begun. As you enter keywords into the search box, matching items are immediately displayed and grouped by category. Make comments on multiple lines of code within a file without annoying your teammates. You control when you send notification emails. Less distractions, increased productivity. Swarm now includes a new Perl-based trigger for Windows, which offers all the features of the Unix trigger, so that there is a single standard trigger script for all supported platforms.